Photo of Rev. Martin Luther King Jr. from the Library of Congress. Martin Luther King Jr. is one of the most prominent faces of the American civil rights movement, having set the standard for nonviolent activism in an era of rampant racial discrimination. Jan. 15 marked the 90th anniversary of his birth. 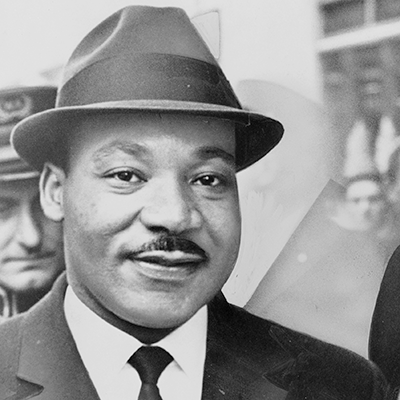 This Monday, a national holiday honors the memory of a man who taught us to never stop striving toward equality. But King is far from being the only civil rights trailblazer. People have fought many kinds of discrimination based on gender, age, disability, religion or sexual orientation. This week, we’d like to ask: Who is your favorite civil rights hero? Who inspires you from the past? Who do you support today? Do you have a favorite civil rights lawyer? Answer in the comments. You can also answer via Facebook below and LinkedIn. Read the answers to last week’s question: Have you ever thought about writing a book?